Table salt, or the common salt that you use in your day-to-day cooking, has been used by humans for many centuries. 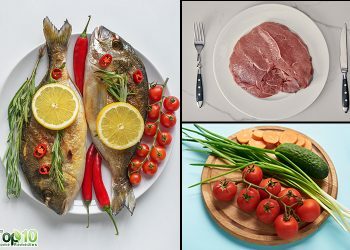 Interestingly, saltiness is one of the five basic taste sensations, along with sweetness, sourness, bitterness and umami (savory). While a limited amount of salt is essential to the health of humans and some animals, it’s become well-known that excess salt consumption is bad for your health. Nevertheless, it’s still helpful to have a jar of it in your cupboard. Today, salt is not just used for consumption purposes. There are many uses for this amazing substance—uses that go far beyond cooking and flavoring food. 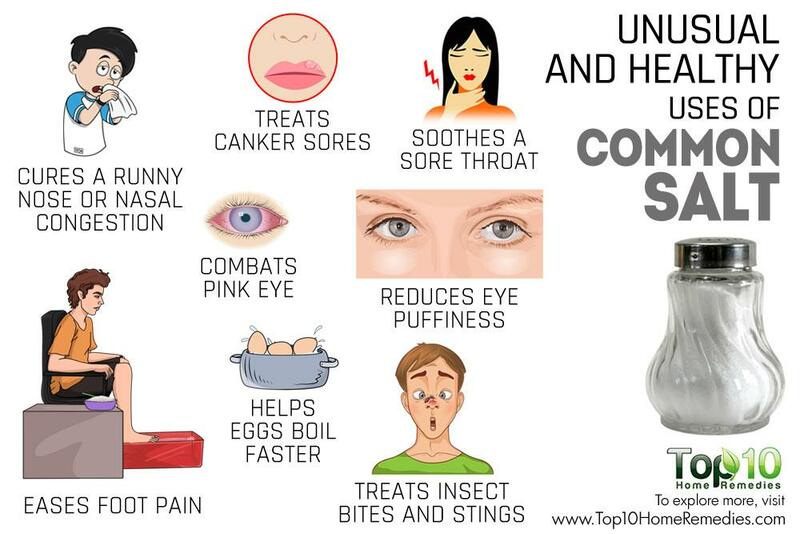 These surprising household, beauty and health uses will surely change your outlook toward common salt. Here are the top 10 unusual and healthy uses of common salt. 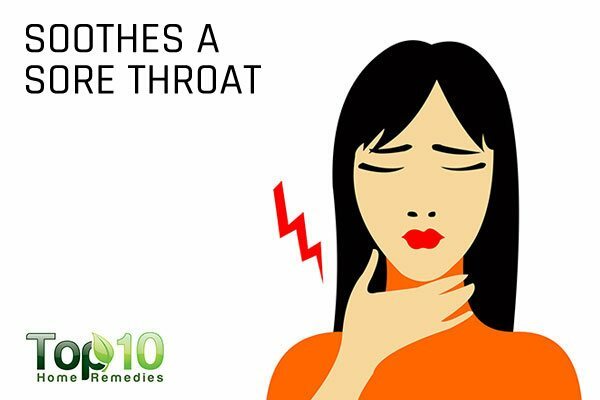 A sore throat, which can be due to many reasons like the common cold, dry air, excessive shouting or throat infection, can be treated with common salt. Gargling with salt water will help fight pain and inflammation associated with a sore throat. Salt works like an antiseptic and helps fight the infection cauing your sore throat. Add ½ to 1 teaspoon of salt to 1 cup of warm water. Stir it well to dissolve the salt. Do this at regular intervals for a few days. 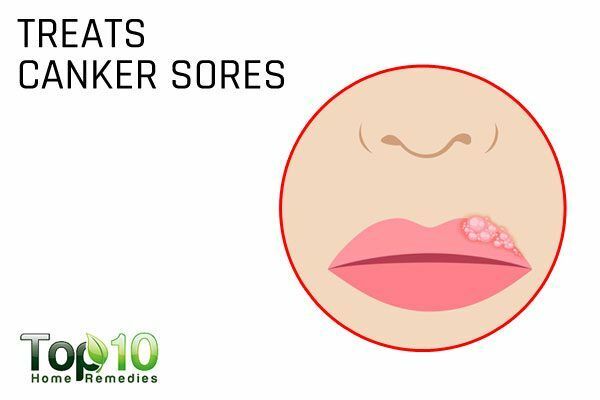 A canker sore, which is an ulcer on the mucous membrane inside the mouth, can cause a burning sensation, pain, inflammation, fever and swollen lymph nodes. 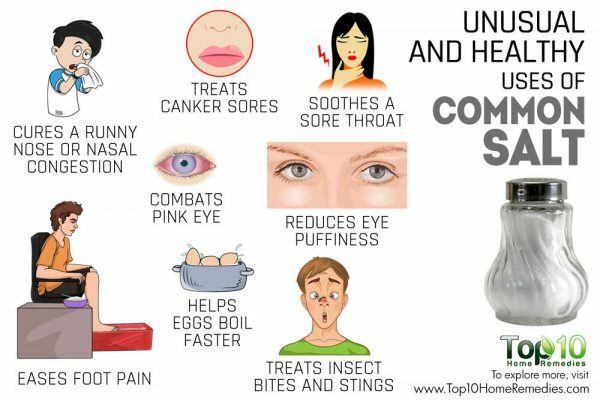 The condition is very painful as well as irritating, but you can get relief from the problem with table salt. A salt water gargle will ease the pain and help draw the fluid out of a canker sore to speed up the healing process. Dissolve 2 teaspoons of salt in ¼ cup of warm water and stir it well. Swish the solution around in your mouth for at least 20 seconds, then spit it out. Repeat the process 3 or 4 times a day. As foot pain can make walking difficult, people want to get rid of such pain as quickly as possible. Whether you have pain in your toes, heel, sole, ankle or arch, you can ease the pain with common salt. Salt also helps soothe tired feet. Add ½ cup of salt to a small tub of warm water. Soak your feet in the warm saline solution for 10 to 15 minutes. Pat dry your feet and massage gently for 5 minutes. 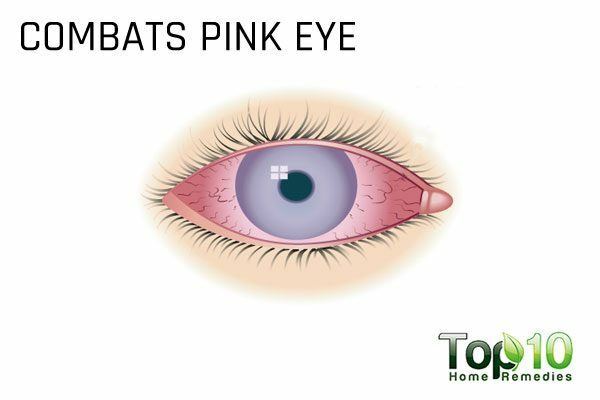 Pink eye, also known as conjunctivitis, is an irritating and uncomfortable condition that can be treated with salt. Salt works as a natural disinfectant that can help fight the cause behind the problem, such as bacteria or a virus. It even soothes the pain and redness. Boil 1 cup of distilled water mixed with 1 teaspoon of salt. Use the solution as an eyewash, using an eyecup or dropper. Salt is even a great toothpaste alternative, which you can use to keep your teeth clean and free from bacteria. Salt particles help get rid of plaque on your teeth, which in turn reduces the risk of many oral problems. In fact, common table salt is one of the most widely used ingredients in commercial oral care products. Dip your moistened toothbrush in table salt or sea salt, then brush your teeth with it. Do this at least once daily. 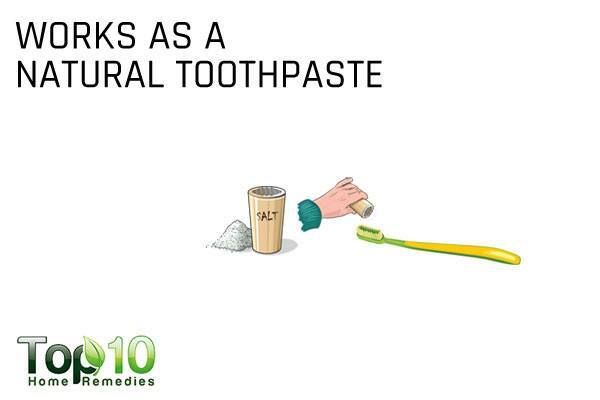 You can also mix common salt with an equal amount of baking soda and brush your teeth with the mixture regularly. Note: When using salt, be gentle or else it can damage your gums and tooth enamel. 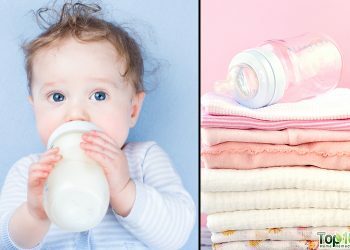 Whether you end up with puffy eyes in the morning due to a late-night date or after a good crying session, you can easily reduce the problem with salt mixed in water. 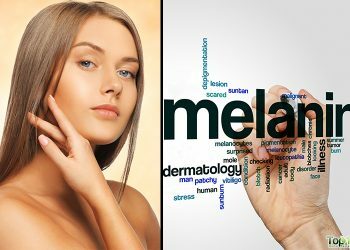 While the salt will help draw out the moisture and tighten the skin, the heat from the warm water will lessen the inflammation. Mix ½ teaspoon of salt in a bowl of lukewarm water. 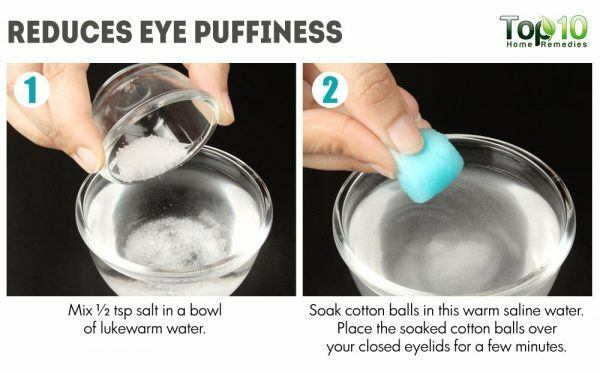 Soak cotton balls in this warm saline water. Place the soaked cotton balls over your closed eyelids for a few minutes. 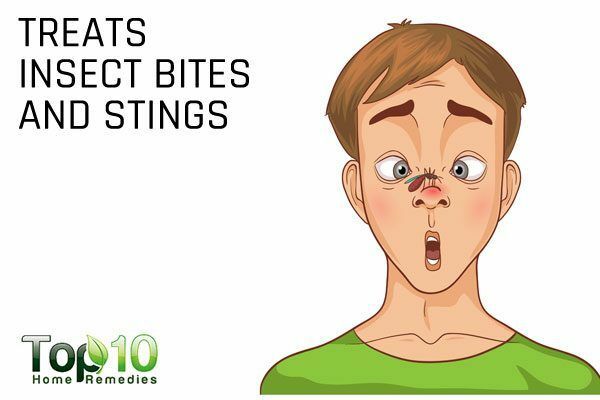 Insect bites and stings, can be painful and itchy. To reduce the discomforts, all you need is a handful of common salt. Salt is a great way to help neutralize the venom of a bee or yellow jacket sting. Due to its antiseptic properties, salt also disinfects the site of injury. It draws out the toxin immediately and effectively reduces pain and inflammation. Wash the area with antiseptic soap and lukewarm water. In case of a bee or wasp sting, remove the stinger very carefully before rinsing the area. 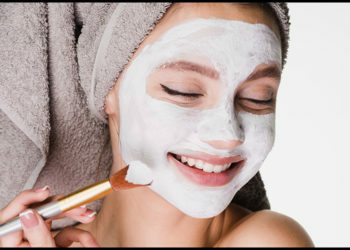 Apply a paste of salt and a little water on the site of the bite or sting. Allow it to dry, then rinse it off after 30 minutes. 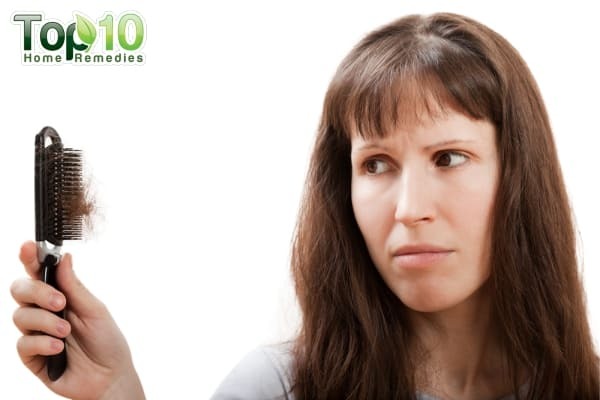 For an adult or child, a saline rinse for nasal irrigation is one of the best home remedies for a runny nose. Salt will help loosen up mucus, making it easier and more comfortable to expel. It will even clear the nasal passages of irritants and make it easy for you to breathe comfortably. Mix 1 teaspoon of salt in 2 cups of warm distilled water. Use this solution for nasal irrigation using a neti pot or some other irrigation device. Repeat 1 or 2 times daily for a few days. Note: Wash the irrigation device after each use. 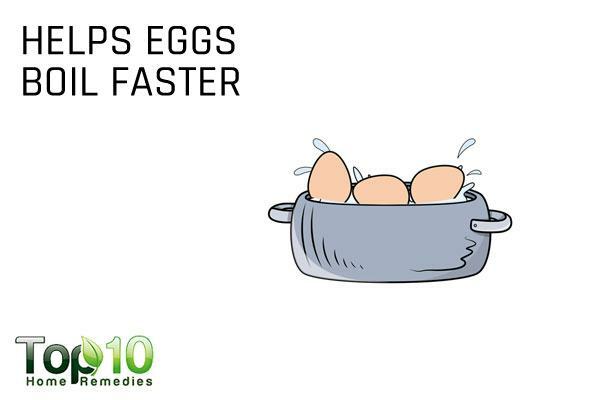 When boiling eggs in water, add a little salt to the boiling water before adding the eggs to help the eggs cook faster. Adding salt helps raise the boiling point of water. Plus, it prevents cracks by coagulating the egg whites more quickly. However, you may not want to add salt to water when preparing a soft-boiled egg as it produces a more rubbery texture suitable for hardboiled eggs. Table salt can also help remove tarnish from silverware. It helps speed up the chemical reaction required for removing the tarnish. Plus, it works as a great natural abrasive to scrub the gunk off the silver. Line a large roasting pan or plastic tub with aluminum foil. Pour hot water in the pan or plastic tub. Add 2 tablespoons each of table salt and baking soda. Optionally, you can add 1 tablespoon of white vinegar as well. 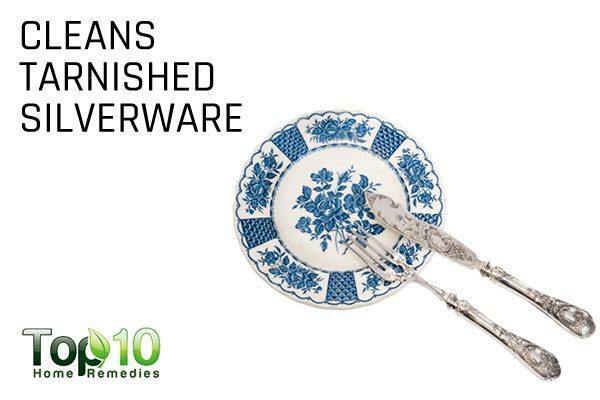 Soak your tarnished silverware in this solution for 3 to 5 minutes. For heavily tarnished silver, you can also scrub the silverware with an old toothbrush. Finally, wash it with warm soapy water.